We know many STH readers use dual-socket workstations either for more CPU power, more RAM or simply more I/O. 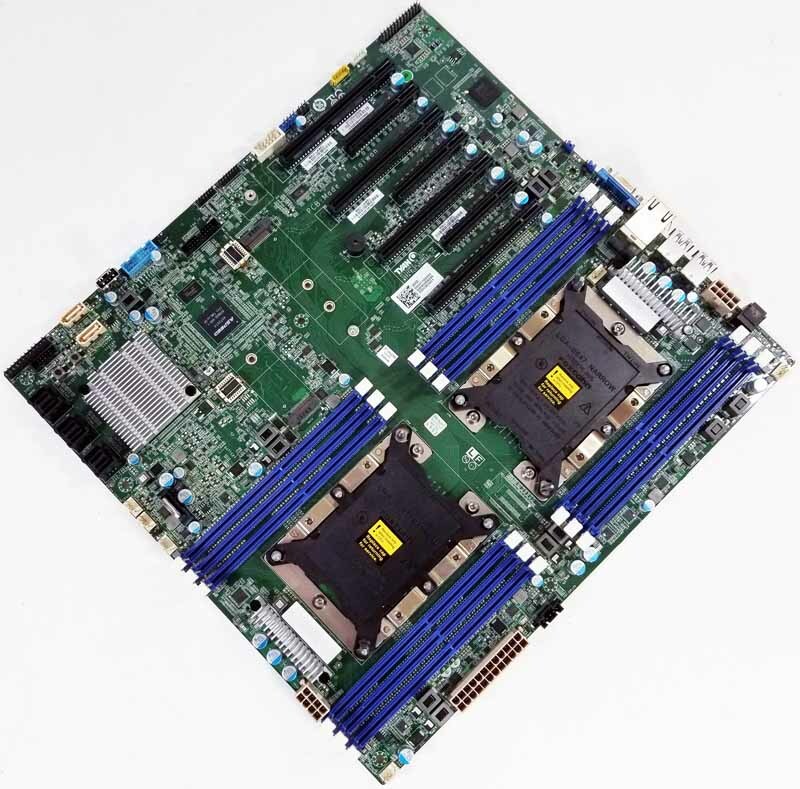 We have in the lab several dual socket workstation motherboards based on the new Intel Xeon Scalable Processor family (Socket 3647). 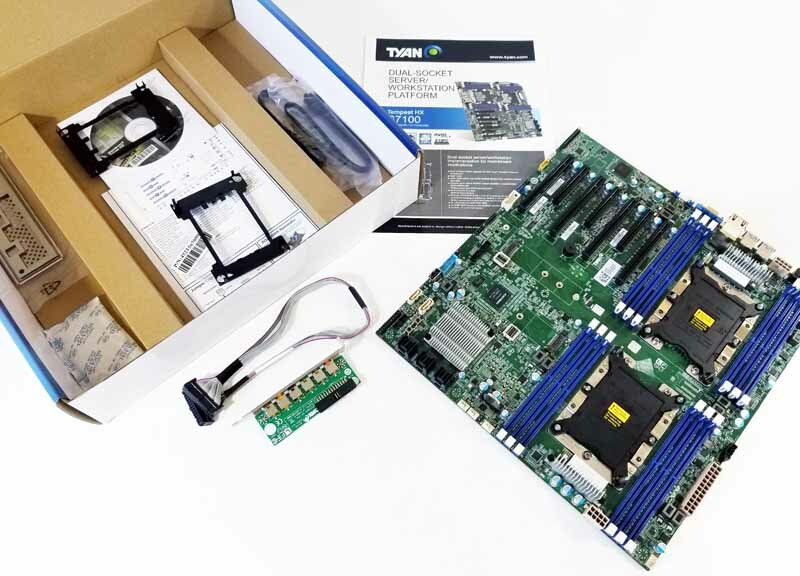 In the lab, we have one of Tyan’s Tempest HX S7100 motherboards which is the subject of this review. The Tyan Tempest HX S7100 geared for multi-GPU setups with 7x PCIe slots, four of which provide full electrical x16 links. That gives the capability of running four dual width, full length 12.3” GPU’s popular for a range of professions from engineering and creatives to AI and DeepLearning. Like the Tyan S7106GM2NR we reviewed earlier, we see the same packaging with the S7100. Let us open up the retail box and take a look at the contents. The top compartment holds the motherboard, and we find all the accessories on the side or under the motherboard. As we are going to see, there is an entire riser dedicated to audio. Let us take the Tempest HX S7100 out and get a look at this motherboard. 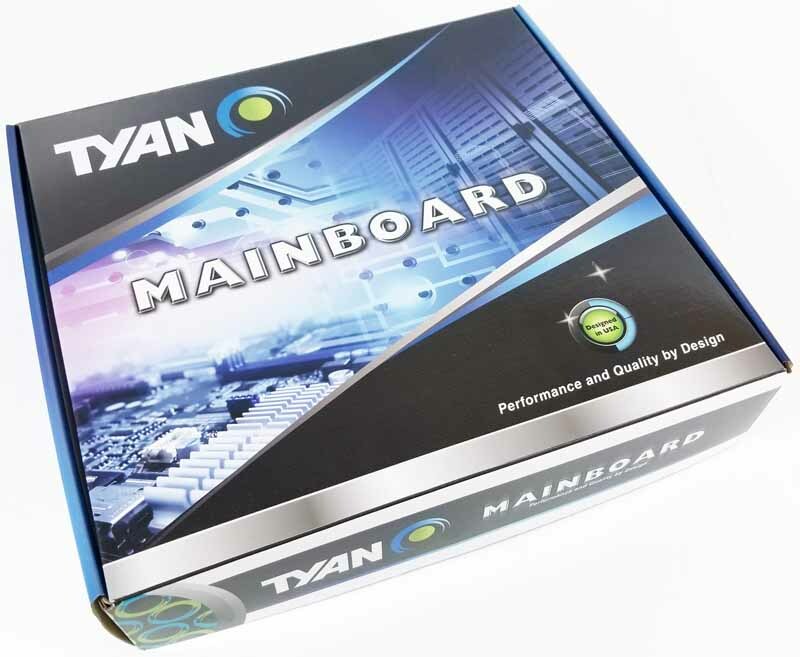 The Tyan S7100 Motherboard is laid out in typical fashion for a motherboard in this class. We do note that power connectors are spread out on three edges of the board. This layout is not much of a problem, however, some power supply CPU power cables might have difficulty reaching all three. 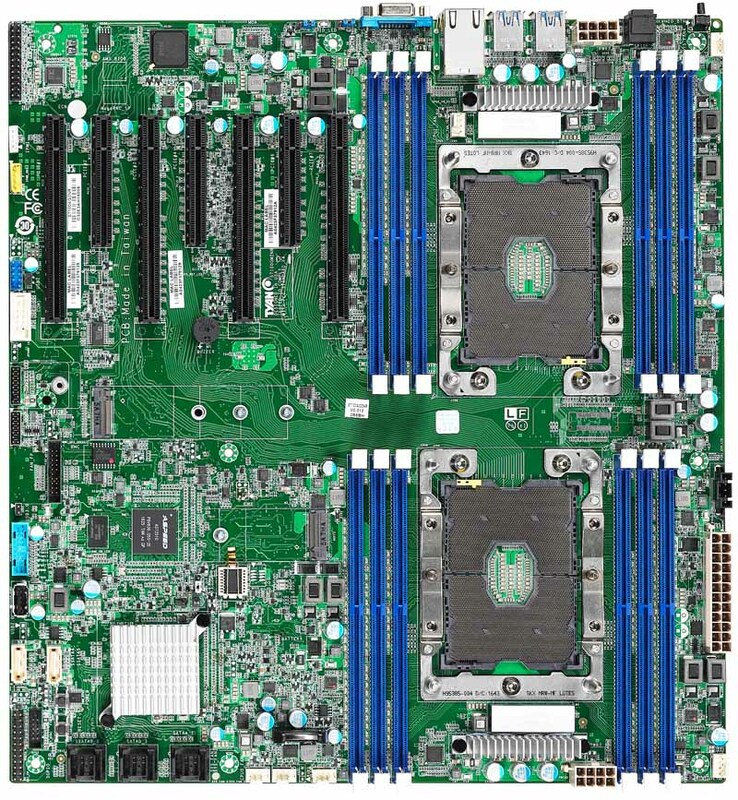 At the middle of the motherboard, we see two M.2 locations which give good options for OS and cache drives. At the top left, we spot the audio header which uses the optional 7.1 channel HD audio via internal header. One attaches the supplied cable from the motherboard to the expansion bracket that holds audio ports and viola, you have audio. Remove the cable and bracket and this can easily function as a standard server motherboard. It is certainly a unique way to build a versatile platform. Here we see our S7100 Motherboard active heat sinks installed and connected to fan headers. Fan headers appear to spread out; four located at the front of the motherboard, and a fifth located at the back near the IO outputs. CPU heatsinks that use two fans will find the needed headers for the front socket at the front of the motherboard, the back socket will need to route one of the fans to the front header. The lower left corner is where we find the storage ports, 3x mini-SAS HD (4-in-1) connectors ports give 12x ports total, two SATA III ports are spotted off on the left side of the motherboard. Starting at the edge of the motherboard, we find slot number one. At the corner of the S7100 we see the header for the optional Audio connector. The M.2 NVMe SSD drive mount uses a screw hold down assembly. This method locks the drive firmly in place but can be difficult to access when installing in a case. There are very few ways to design M.2 SSD slots in motherboards of this class, so on balance this makes sense and is par for the course. Aside from the S/PDIF optical output, this looks largely like a standard server motherboard I/O panel. The S7100 retail kit includes a CD Driver disk which you can use to install drivers. 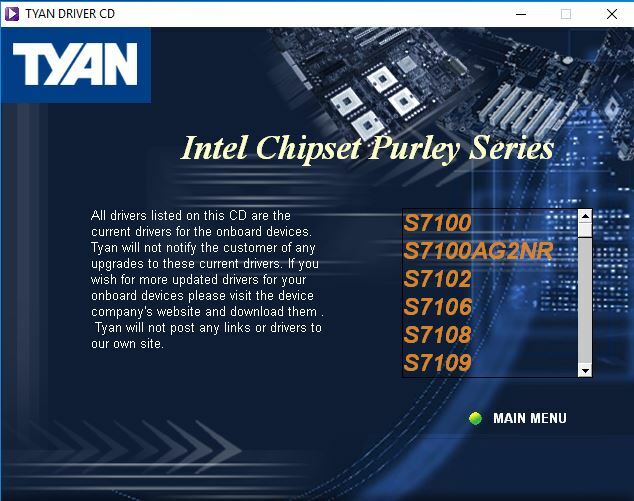 The included drive CD includes drivers for several Tyan motherboards. Select Install Main Board Drivers and drill down to the Install Drivers section. From this screen install what drivers you will need to get your system up and running. The CPUs are 8 core / 16 thread CPUs with a 3.2GHz base clock. They are a midrange workstation part that we can recommend highly. Let us move on to our benchmark results. Overall strong numbers for memory bandwidth. Here we can see great performance. 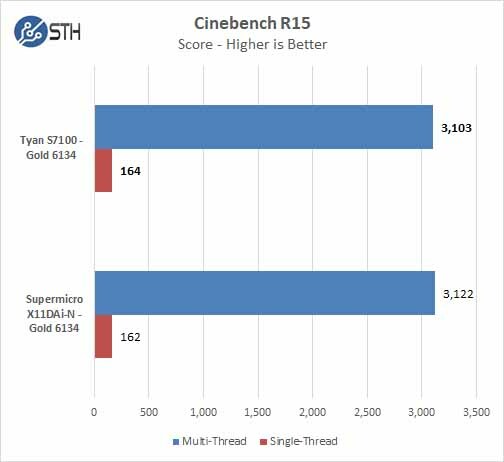 At STH, we have actually broken Cinebench R15 with a quad Intel Xeon system that scores over 11.5K with Platinum 8180 CPUs. 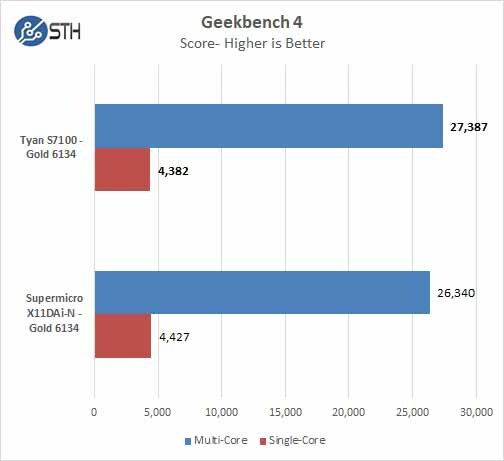 Geekbench 4 measures the compute performance of your GPU using image processing to computer vision to number crunching. Overall scores are solid in this benchmark suite. 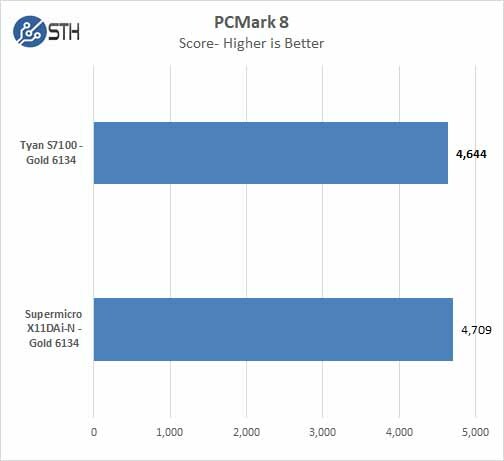 Solid results again, well ahead of lower-end workstation scores. 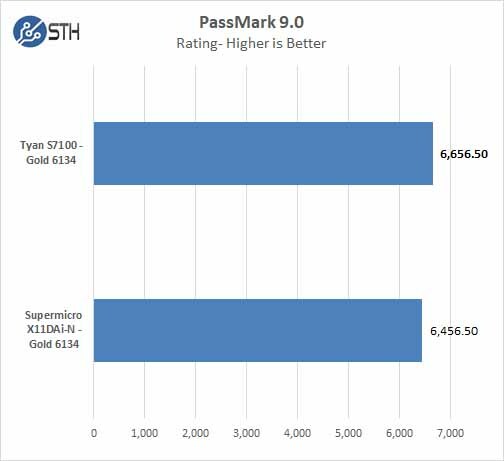 PassMark Performance Test allows you to benchmark a PC using a variety of different speed tests; it tests the entire PC and all its components. Our benchmark tests show very close results across the board. 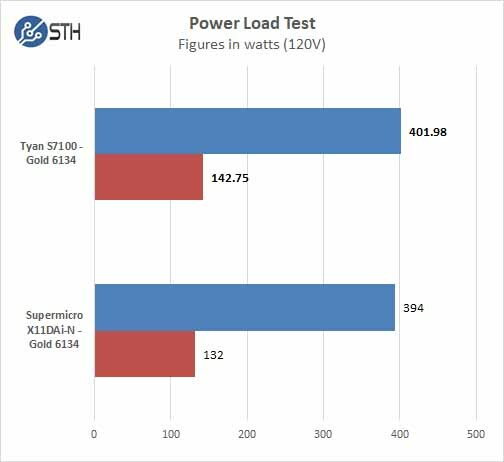 In some tests, we see slightly better results with the S7100 which shows the good optimizations for workstation-related workloads. Power consumption can vary a large amount depending on processors used and the number of HDDs/SSDs/Expansion cards used. Here we test just a basic system. 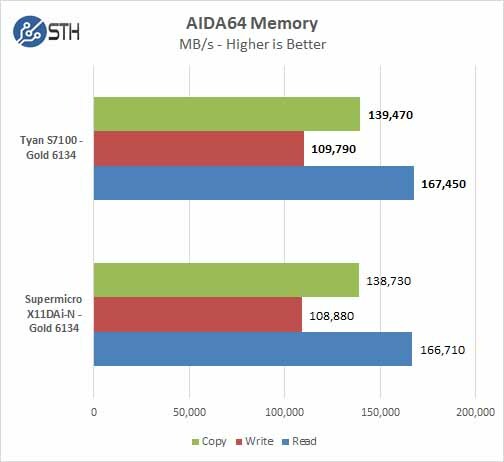 For our tests, we use AIDA64 Stress test which allows us to stress all aspects of the system. We do not stress test the GPU in these tests. 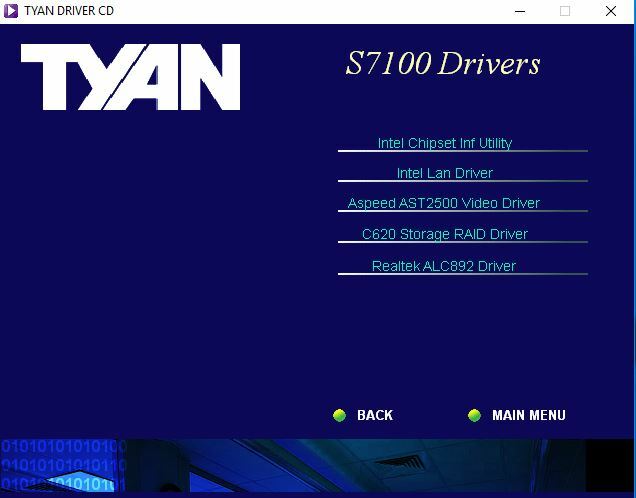 While setting up the Tyan S7100 we found it to be very fast at booting, much like a single socket enthusiast motherboard. Fast booting is a welcome trend we have noticed with the new dual Socket LGA 3647 systems we have tested so far. Fan header locations for the processor heatsinks might present a challenge when using larger 4U dual fan heat sinks, for our single fan heatsinks we had no issues. In hindsight, we would have been better served with quieter 3U units but they were not available in the channel when we started testing this platform. If your applications require audio outputs the S7100 comes equipped with S/PDIF outputs. More common Mic, Line Out, Front, Surround, Center, and Side Surround outputs require the optional Audio Kit to be installed. One of the CPU power connectors takes up much needed space at the back of the motherboard which would normally be used by an audio output stack, this is not a problem but does push audio connectors to the optional audio output kit and uses a PCIe case slot. We would also like to see more USB ports at the back of the motherboard, two of the four ports are used by keyboard and mouse leaving only two for other uses. While USB hubs are plentiful, and we see this motherboard having an easy time transitioning into a desk-side server, it would be a nice to have. 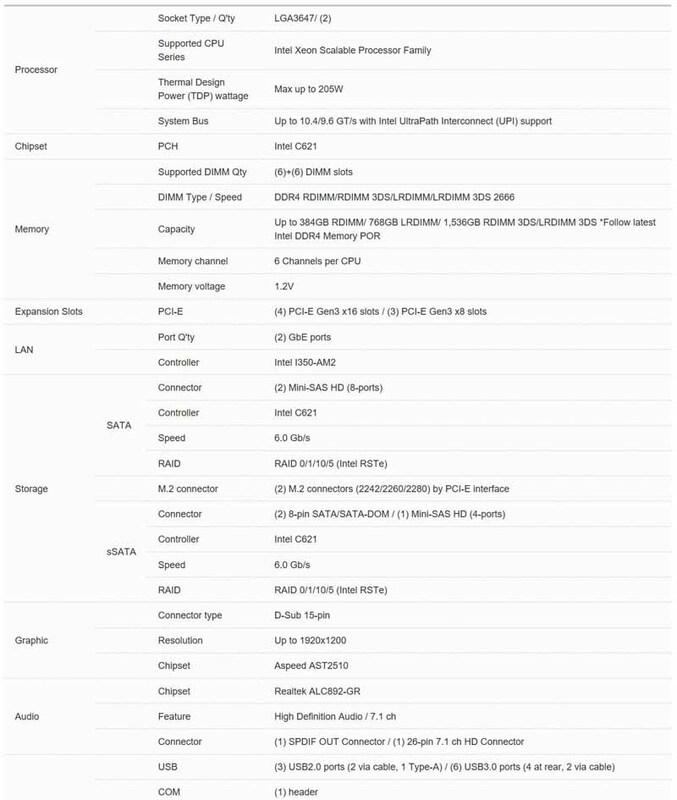 The S7100AG2NR workstation motherboard we reviewed does not come with IPMI which we would like to see, however, the S7100GM2NR version does include IPMI, but does not include audio which makes it better suited for server use. The S7100 is a solid workstation motherboard which performed very well in our testing. The Tyan Tempest HX S7100 is an excellent desk-side platform. It exposes a wide range of GPU and PCIe expansion capabilities to users and can fit dual Intel Xeon Scalable CPUs. Our review unit had onboard 7.1 audio that differentiates it from traditional server motherboards. how much is this MB/dual Xeon Gold 6134/12x 16GB ram cost? I just built a dual e5-2696 v2/asus z9pe-d16/64GB ram for a total of $1050. And it got 3050+ on cinebench. Newer is not better….. just means more expensive sometimes….lol…. The reviewed mb is really more of ws… lack of ipmi makes it very limited as server…. 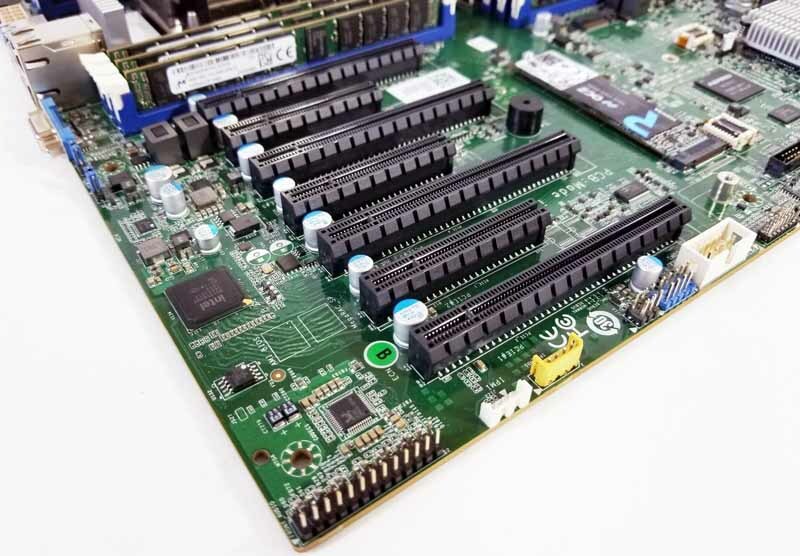 This looks like a nice workstation motherboard, though I would prefer to have dual bank, 8 channel RAMM even if that means increasing the size of the PCB. I failed installation of Windows 10 on this S7100. Is there any special option of required setting to install windows 10 pro?